« Right Angle Weave – Get Slinky! I absolutely love the look of rivolis, and judging from what I have seen, a lot of others do too! I thought I would share some rivoli pendants I’ve made, and talk a little about them. Just a quick overview on what a rivoli is. Most commonly they are made by Swarovski, and they come in diameters from 8mm through really huge (28mm is the largest I have seen to date). The most commonly used sizes are 12mm, 14mm and 16mm. What makes a rivoli different is that it has both a pointed top and a pointed bottom, with the bottom being a shallower depth. This provides for more facets in the crystal, which of course means more sparkle! The challenge is that because the back isn’t flat, it takes a little more maneuvering to incorporate these gorgeous hunks of bling into your jewelry. And by glass, I mean working with rivoli stones. I am lucky enough to live within an hour of a bead store that often has nationally-known teachers. I signed up for two classes with Amy Katz, and am I ever glad that I did! Not only is Amy a fabulous teacher, but she is a wonderful person. If you get a chance to take a class with her, do it!!! The two rivoli pendants at the top of this post are part of one of Amy’s projects. She has a unique style of cradling the rivolis so that they are secure. Then you can have lots of fun embellishing them! The project in the class used small 3mm pearls as part of the embellishment, which made the rivoli stand out. 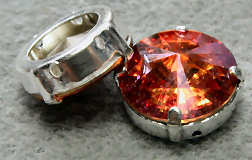 These pendants use 14mm rivolis. My style of jewelry-making means that I make the project once (or maybe twice) the way the teacher explains, then I go off and make my own versions. I probably seemed like a “loose cannon” to poor Amy! 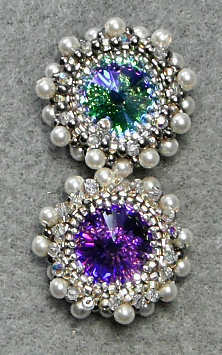 For the two pendants on the right, I used a more “bling-y” approach. 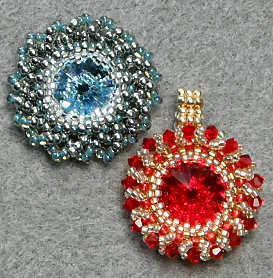 For the red pendant, I used 3mm Swarovski bicones as part of a swirl around the rivoli. For the aqua stone, I used the same basic steps. However, instead of using a bicone as part of the swirl, I used more seed beads. It’s kind of hard to tell, but this pendant is larger overall than the red one. As is usual for me, I made some of these pendants to give as gifts. And as even more usual, I neglected to take photos of the pendants before I gave them to their (I hope happy) owners. One of the pendants was made using an 18mm rivoli, which took a little more experimentation to get the back the way Amy taught (but I did it!). The other was done in another Glacier Blue 14mm rivoli. I split my rivoli purchases between the bead store and ebay. And on ebay I recently ran across some really cool stones — they are sew-ons! Naturally, I had to scoop up some. Do I know what I will do with them yet? Of course not, LOL! Well, actually I will probably use them in a bead embroidery project I am contemplating. There are plenty of places, both physical stores and online, that sell these wonderful crystals. Shop for them where you like best! But do get some and experiment with these glorious crystals!